I often heard worries in the coffee community about a difference of quality in the coffee grind size distribution when grinding with a full hopper versus a single dose of coffee in an otherwise empty hopper. The idea behind this is that coffee beans forced through the rotating grinder burrs have no choice but to go through whatever openings they encounter between the burrs. In contrast to this, a single bean in an empty hopper will bounce around and may end up passing through a larger hole between the burrs when the opportunity arises, because nothing is forcing it to pass through very fast. This bouncing around of a bean is what “popcorning” refers to. As a result of this effect, beans that popcorn will end up getting ground somewhat coarser on average. Grinding a single dose of coffee in an otherwise empty hopper will therefore generate two kinds of coffee grounds: a first batch of slightly finer grounds resulting from beans forced through the burrs, plus a smaller batch of slightly coarser grounds resulting from the last beans that popcorned. The result will be a distribution of coffee particles slightly wider than what you would have obtained if you ground a small dose of coffee with a full hopper. This more uneven distribution of grinds will cause an increase in the amount of coffee particles larger than average, sometimes called boulders. As I mentioned before on this blog (e.g. see this article), only the surfaces of coffee particles extract efficiently when you brew the coffee, and this larger amount of boulders will limit the amount of coffee compounds that you are able to extract quickly and evenly. Several people therefore suggested that it is best practice to grind with a full hopper, and even to grind one bean at a time if you are extremely patient and want to grind a single dose of coffee at a time. Now that I built a tool to measure particle size distributions, I decided to test all of these claims. They all make sense, but none of these arguments are really telling us how important this effect is. To do this, I ground 3 different doses of 10 grams each on my Baratza Forté BG grinder. I used the same coffee for all these tests, which is important (especially the roast profile may affect how the coffee shatters). In this particular case, I used a relatively light roast of an Ethiopian Guji by Saint-Henri roasters in Montreal. I ground them on setting 6L with the factory-set zero position. In my case, this means burrs would only touch if I went 3-4 ticks finer than 1A. The first dose was ground with a hopper full of beans, the second one was ground by dropping just 10 grams of coffee beans in an empty hopper, and the third one was ground one bean at a time. This last batch bored me to hell. I measured the particle distribution of each dose by taking 12 different samples sprayed on a 8.5″ by 11″ sheet of paper and combining them together. I took that many samples to make sure that I would have good statistics to be able to resolve minute differences in particle size distributions. I decided on the number 12 because I noticed that comparing the first 6 data sets combined together looked similar to the last 6 combined together when binning the particle size distributions in 16 distinct particle surfaces, so having double that amount of data seemed conservatively good enough. As a first test, we can ask ourselves how important the popcorning effect is, i.e. how much coarser do the grounds come out compared to beans forced into the burrs ? To do this, we need to compare the full hopper versus the bean-by-bean doses. What I call the “fraction of available mass” in this figure is the mass of coffee that is available for extraction if you assume that only outer shells of 100 micron are extracted in each coffee particle. This is just an approximation, but it is already more meaningful than just looking at the total mass of coffee particles. 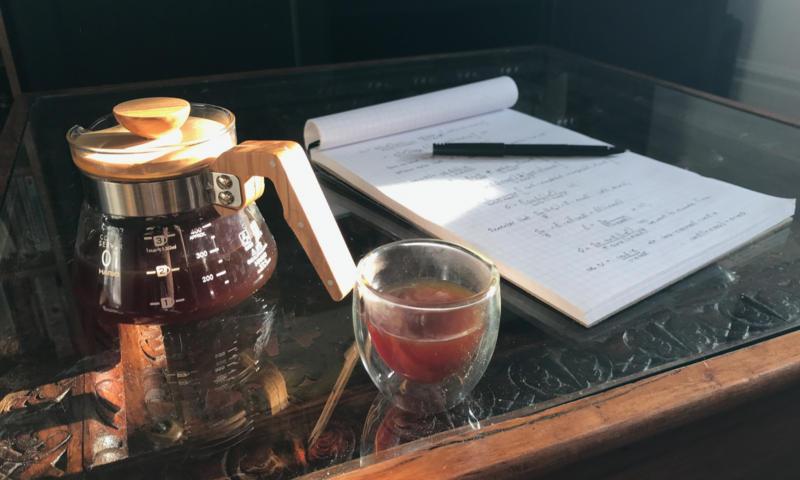 For more information, I suggest reading this previous blog post where I discuss a very interesting experiment carried by Barista Hustle to explain why this approximation makes sense. Basically, we want our particle size distributions to contain some information about how the coffee will extract, so we don’t care about weighing the cores of coffee particles that will never be extracted. I also talked about this more here and here. Another thing to notice in the figure above is that the horizontal axis indicating particle surfaces is in logarithmic scale. This means that every shift of e.g. 60 pixels to the right corresponds to a particle size twice as large. On top of each distribution, there is also a single data point with horizontal error bars, that respectively indicate the average particle surface and the spread of the distribution on each side. As we saw, popcorning beans are ground approximately 5 clicks coarser on the Baratza Forté BG. A strategy suggested by Scott Rao to grind a single dose was to start at your desired grind setting, and then change your grind size to something slightly finer when you see that your beans start popcorning. This figure above tells us that, if you wanted to do this, it would be appropriate to grind exactly 5 clicks finer when the beans start popcorning. That may require mastery of the on-the-spot Forté fine controls. As you can see on this figure, the two distributions are virtually undistinguishable. This means that the popcorning affects such a small fraction of the 10 grams dose that I was not able to see any difference with this analysis. As you can imagine, the effect will be even smaller on typical doses which tend to be around 15 to 25 grams. As we saw previously, the last few popcorning beans were clearly affected and they were ground coarser, so there has to be a difference between the two particle size distributions even though it is a very small one. But to put this in perspective, the overall difference on a 10 grams dose has to be much smaller than one click on the Forté, and also much smaller than the difference in grind quality between all different brands of grinders I have ever tested. This includes Comandante’s C40, Orphan Espresso’s Lido 3, Mahlkonig’s EK43, Lyn Weber’s EG-1 and Baratza’s Forté BG. All of these grinders generate particle distributions that a similar analysis can easily distinguish. This distribution illustrates how well the grind size app can distinguish between the quality of the grind distribution of the Lido 3 hand grinder versus the Baratza Forté BG grinder. The difference between an empty and full hopper seen in the last figure is minuscule compared to these cross-grinder differences. The take out message that I got from this experiment is that popcorning has a non-negligible effect on grind size, but it affects a negligible amount of beans in any reasonable dose of coffee. You should therefore not be afraid to grind single doses at a time, because any degradation that results in your particle size distribution will be much smaller than any difference between brands of grinders. I’m hoping this post will alleviate the admittedly first-world and very geeky problem of single-dosing anxiety. For those geek enough to ask or even to make it this far in the post, I did make my data public on Github. I’d like to thank Douglas Weber for useful comments, and Victor Malherbe for proofreading. Hi Jonathan, thanks for all your hard work. I wasn’t sure if you also tested Burr size, or hopper size, and if it will make a significant difference in these results? Also, do you think Burr RPM will make a difference? Hey Craig, thanks. I did not test any of these, only used the 54 mm burr that comes with my Forté BG, and the hopper that comes with it. I would be surprised if any of these make a difference – the relevant phenomenon here is having a force that pushes beans through the burrs or not. Chute design could have an effect, but the main takeaway that pop corning just happens on a very small amount of beans should also not depend on any of these things, meaning that single dosing is probably not an issue for > 10 grams doses on any grinder.